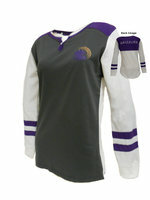 Grey, long sleeved women's henley with accents of purple and white sleeves. The front features the "Grizzly" power head screen printed on front, left chest and the back features "Grizzlies" across the entire upper back. 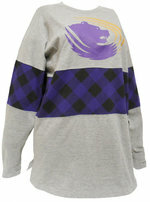 Oversized gray long sleeve tee with purple and black plaid inset stripe. "Grizzly" power head in purple and gold on the upper front. 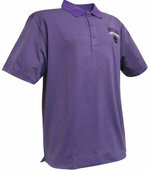 90% cotton 10% polyester. 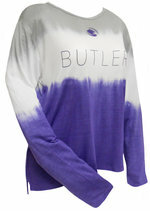 Purple short sleeve tee shirt "Butler Nursing" imprinted in white on the upper left front, "Nurses lifting spirits touching lives" imprinted in white on the back. 100% cotton. 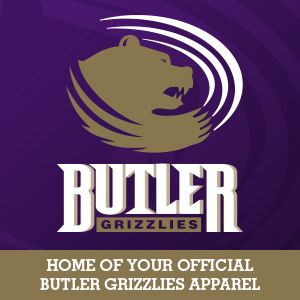 S - Branded Nike Black Fly Shorts "Butler Grizzlies"
Navy heather knit sweatpants with light blue accent stitching, "Butler Grizzlies" imprinted on the upper left front. 89% polyester 11% cotton. Black, dri-fit thermal sweatpant with "Butler" vertically imprinted on the bottom left leg.